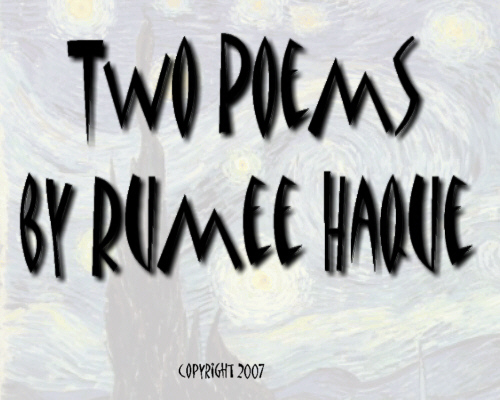 Two Poems by Rumee Haque: My Monsoon Full Moon, Is It Real? Covered the full moon night. Author's note: The last short stanza was inspired by a song by Nobel Laureate Tagore. Copyright 2007, Rumee Haque. © This work is protected under the U.S. copyright laws. It may not be reproduced, reprinted, reused, or altered without the expressed written permission of the author. A graduate of England's oldest writing institute (The Writing School), Rumee Haque has worked as contributing editor with a foreign language weekly Ekush, published from Hollywood. Apart from poetry, she does translation work, writes short stories, articles, and is working on a screenplay for her brother who is an award-winning film-maker. Her poetry has been published at Poetry.com and Poets.com and won two Editor's Choice Awards from Poetry.com.